Setting one potential example for how other states can treat the threat of white supremacy, Florida is treating the upcoming University of Florida visit by Richard Spencer as a state of emergency. The order enables state agencies to respond to the event like a natural disaster, allowing them to temporarily circumvent regulations to adequately fund the emergency response. 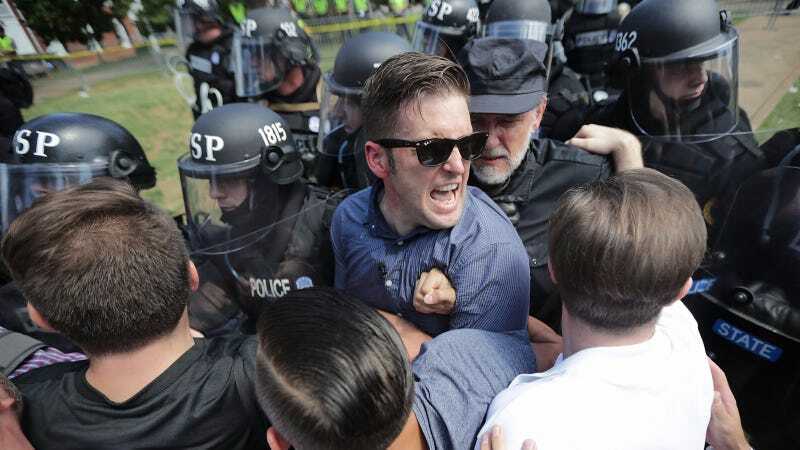 The fear, of course, is that Spencer’s hate speech will incite violence like that in Charlottesville, when Spencer and his neo-Nazi pals marched down the streets of UVA’s campus in August. The Phillips Center, where Spencer is speaking, has a capacity of 800. The Florida National Guard will be on standby and at least 500 police officers will be working around the event. University of Florida has rejected Spencer’s attempt to speak on the campus before, but Spencer has since threatened to sue over free speech rights. “The values of our university are not shared by Mr. Spencer, the National Policy Institute, or his followers,” said University of Florida president Ken Fuchs in a Facebook video, explaining why the university was now permitting the event. “If you are like me, I expect you are surprised that UF is required by law to allow Mr. Spencer to speak on our campus, and that we are not allowed to bill him for the full cost of keeping our campus safe.” Officials estimate the school will pay $500,000 in security fees.